Holi Celebration has been cancelled due to bad weather conditions. Come join us for Holi celebration on Sunday, March 4th, at 11:30AM at Huntington Beach. Bring your friends and family to celebrate this auspicious event. SCGCS will provide color and popcorn, please bring your own lunch. Beach Blvd and PCH, right-hand side parking when you come in from Beach Blvd. Holi may be cancelled due to weather conditions. Please check back before attending event. Ram Navmi celebration will be at the Gayatri Mandir this year, where SCGCS will sponsor the dinner at the of Bhajans. If you would like to sponsor the Ram Navmi celebration than please contact one of the board members. We will have the summer picnic on June 24th (Sunday) at Carbon Canyon Regional Park. SCGCS will provide lunch free of charge to all members who attend. Please come to GROUP SITE #1. We hope to see you there! If you have any questions please contact Dr. Dinesh at 714-402-6833. We were fortunate enough to be able to reserve camping this year at El Capitan State Beach in Goleta CA. It’s a fantastic location and is limited capacity for both cars and people. Camping is from Aug 2nd (Thur) through the 5th (Sun). The cost for family of 2 is $200.00 and for a family of 4 is $350.00. Additional details about the outing and the application can be downloaded by clicking here . We encourage you to download and fill out the application ahead of time and make your check payable to “Southern California Gujarati Cultural Society”. We will also have application available at the Picnic and picnic will be the 1st day the application will be accepted. If you have any questions please contact Jigish Shah at 909-477-1447. Download the Camping Form by clicking here. 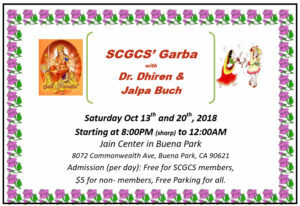 This year the Navratri celebration will be at the Jain Center in Buena Park, located at 8072 Commonwealth Ave, Buena Park , CA 90621, from 8:00pm to 12:00am. Free admission for SCGCS members and $5 for non-members. Free parking for all. If you have any questions please contact Kirit Patel at 714-321-4991. 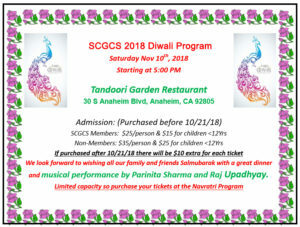 This year’s Diwali program will be at Tandoori Garden Restaurant, located at 30 S. Anaheim Blvd, Anaheim, CA 92805. We look forward to wishing all our family and friends Salmubarak with a great dinner and musical performance by Parinita Sharma and Raj Upadhyay. Limited capacity so purchase your tickets at the Navrati Program! Due to weather this event may get cancelled. Please check the website for updates. Note the event takes place on the Beach and from Beach Blvd pass the PCH and go into the parking lot on the RHS. We are normally less than 100 yards from the entrance.